While Ben Affleck, Gal Gadot, Henry Cavill, and Jesse Eisenberg are front and center in Batman V Superman: Dawn Of Justice, the film is packed with an array of other fine actors. This includes Diane Lane, Laurence Fishburne, Jeremy Irons, Holly Hunter, and the greatly underrated Scoot McNairy. There have been rabid rumors for months about who Scoot McNairy is actually playing in the blockbuster, which is only going to increase now that we’ve got our first look at his character. This picture shows us that Scoot McNairy will be in the courtroom sequence between Holly Hunter’s Senator Finch and Henry Cavill’s Superman, and from the chilling stare that Krypton’s most famous son shoots over to McNairy it’s clear that he’s not happy with him, either. Unfortunately, Scoot McNairy doesn’t actually speak in the clip that he’s featured in, instead we hear the dulcet Georgian tones of Holly Hunter as she talks about the threat of Superman during what looks like a Senate hearing. My guess from this teeny tiny clip is that that McNairy has been brought in to give evidence against, or is even suing Superman, for the damage that he caused during Man Of Steel. 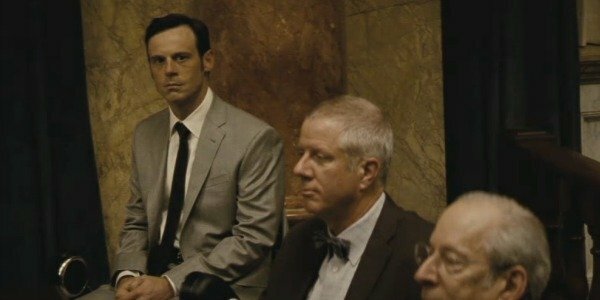 There have been all kinds of speculation about Scoot McNairy’s Batman V Superman: Dawn Of Justice character ever since the Killing Me Softly actor’s presence in the film was announced. It’s previously been teased that Scoot McNairy is playing Jimmy Olsen in the film, with other rumors suggesting that his legs have been partially amputated following the destruction of Metropolis. Meanwhile the actor himself has done a fine job of increasing these rumors with his own clues about the part. Scoot McNairy previously insisted his character is unlike anything he’s ever played before, while he also added that the individual he depicts "lends itself to the story being told" and that he didn’t have to sign a multi-picture deal with Warner Bros.
You can check out our first real look at Scoot McNairy in Batman V Superman: Dawn Of Justice by watching the clip below, which also features a rather darling interview with the always delightful Holly Hunter on ABC's Good Morning America. Obviously we don’t have long to wait now until we found out who Scoot McNairy is in Batman V Superman: Dawn Of Justice, as the blockbuster will finally be with us next Friday, on March 25. And quite a few people are rather excited about it.